The patella is the medical term for the kneecap. The patella normally sits in the groove at the bottom of the femur (thigh bone) called the trochlea. Luxation is a medical term for dislocation. If patellar luxation occurs the knee cap has dislocated out of the groove and the knee no longer functions normally. The kneecap can dislocate towards the inside of the knee (medial) in a condition termed medial patellar luxation or the kneecap can dislocate towards the outside of the knee (lateral) in a condition termed lateral patellar luxation. Medial patellar luxation is a much more common condition than lateral patellar luxation. This condition is most frequently seen as a developmental disorder, whereby the dog or cat is born with a normal knee and the condition develops over time. There is often a malalignment of the muscle system which extends the knee (quadriceps mechanism) which causes the patella to be pulled out of position. This condition can be seen in many breeds and is often considered a small dog breed problem e.g. small terriers (such Yorkshire and Jack Russell), Chihuahua, Cavalier King Charles Spaniel etc. However, large breed dogs can be affected for example Akitas, Labradors and Mastiffs. Whether the condition develops by the same means in these different sized breeds is unclear. Cats can also be affected. Trauma is another potential cause of patellar luxation. If the supportive soft tissue structures around the joint are damaged by a fall or a road traffic accident the patella can dislocate and cause the knee not to function properly. The most common sign of patellar luxation is limping on the back leg. The skipping limp is most commonly associated with patellar luxation. This is a result of the patella acutely coming out of the groove and then when the limp disappears, which can be quite quickly in some cases, the kneecap has relocated into the groove. Some pets will show other signs such as stiffness after rest, a bowlegged hind limb gait and an inability to jump. A positive diagnosis is often diagnosed from clinical examination. The knee is palpated and the kneecap can be felt to be dislocating or dislocated depending on the severity. Some knees are so swollen that the kneecap cannot be properly identified on palpation alone and further tests may be required. In cases where diagnosis is not easily determined on clinical examination further tests may be required such as radiography (x-rays) or assessment under anaesthesia / sedation. Radiographs may show the patella outside the groove in more pronounced cases (grade III & VI) but can sometimes show no significant changes. Signs consistent with the presence of osteoarthritis can sometimes be present in more chronic cases. As these patients have malalignment of the quadriceps mechanism, radiographs of the entire limb is usually required to look for long bone defects namely in the femur (thigh bone) and tibia (shin bone). Patients may require advanced imaging with CT to assess for abnormalities of the skeleton in greatest detail. As the patella can move in and out of the groove, we have concerns regarding the wearing away of the articular cartilage in the joint if this condition is not managed surgically. We would therefore only recommend this form of treatment in exceptional circumstances. If the extension mechanism of the knee (the quadriceps mechanism) is out of alignment then this needs to be addressed above all other issues within the knee. The realignment is most commonly achieved by moving the front part of the tibia, the tibial tuberosity. This is where the straight patellar ligament, the main part of the quadriceps tendon, inserts onto the tibia. A cut is made in this section of bone and the tuberosity is moved to improve alignment. Once this appears in the correct position it is typically stabilised with a combination of pins and wire. Alternatively, if the malalignment comes from a deformity in the femur or tibia then a corrective osteotomy or ostectomy may be required. This is where a cut is made in the bone and the alignment is straightened. A wedge of bone may be removed to improve alignment. This is typically stabilised with a bone plate and screws. If the trochlea is too shallow, then deepening can be achieved by removing either a wedge or block of bone from within the groove. The remaining defect is deepened and then the wedge or block containing the articular cartilage is replaced. This technique preserves the articular cartilage as much as possible. If this procedure is performed alone without addressing the alignment issues, failure of the repair is more likely. This is where the slack tissue around the joint is tightened either by removing the redundant tissue or by overlapping this tissue. Tightening the lax tissue helps keep the patella from easily luxating. This technique may occasionally be used in isolation in very young dogs. This is a recently developed technique which focuses on replacing the groove with a super polished metallic groove. This technique tends to be reserved for patients with severe osteoarthritis, marked articular cartilage damage or if conventional surgical techniques have failed. This is reserved for very severe cases where there are no realistic alternatives. The patella is removed and the knee is allowed to function without a kneecap. Most patients (85%) of patients have a good to excellent outcome following surgical management of medial patellar luxation. Complication rates are slighty higher for lateral patellar luxation corrective surgery. 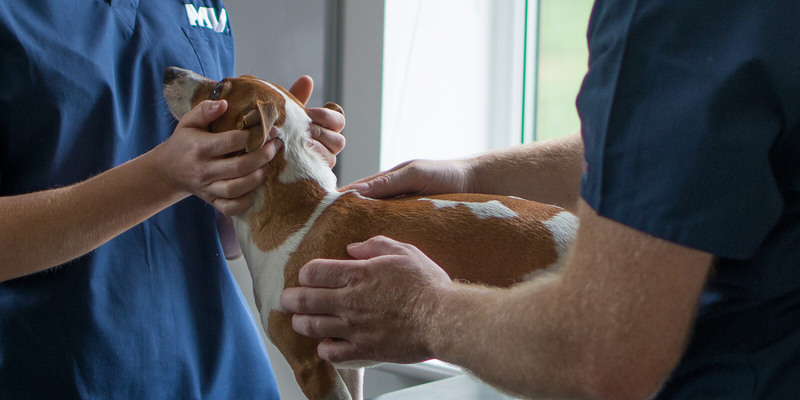 We expect dogs to be able to return to off-lead exercise and be free of medication. Potential complications after patellar luxation corrective surgery? Complications rates are lowest when performed by experienced surgeons. The most common complication is re-luxation. This is where the patella continues to ‘escape’ from the groove. In some cases there is still an improvement compared to pre-operatively and therefore no further surgery may be required. If the clinical signs return revision surgery may be required. Infection is an uncommon complication but if detected treatment will be with antibiotic therapy. If there is minimal response to treatment implant removal may be required at a later date which does not tend to affect long term outcome. Failure of the surgical implants is where the pin or wire bend, break or loosen from the bone. This can cause significant discomfort and implant removal may be required. Revision surgery may be necessary if there is disruption to the surgery site. Seroma formation is where a ‘bubble’ of fluid forms underneath the skin, over the ends of the implants. This can resolve on its own but if it is uncomfortable or appears to get worse, implant removal will be necessary which typically resolves the issue. Fracture of the tibial tuberosity or ‘cheese wiring’ is where the bone fails around the implants and can cause disruption to the surgery site. This is a rare complication. Keeping patients appropriately confined after surgery and adhering to the post-operative care plan given by the surgeon keeps the complication rate to a minimum although this does not completely eliminate all risk.